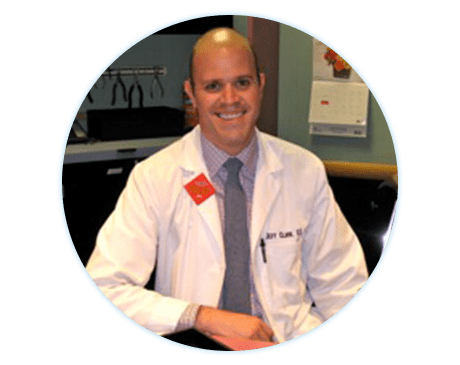 Jeff Clark, OD, is an enthusiastic and highly skilled doctor at Antelope Valley Optometric Center in Lancaster, California. Dr. Clark treats children and adults of all ages for a wide range of eye care needs, concerns, and conditions. His areas of expertise include comprehensive vision exams, eyeglasses, contact lenses, co-management of LASIK surgery, children’s eye care, and treatment of a range of eye conditions, including retinal diseases and issues like astigmatism and macular degeneration. After completing his undergraduate studies at Loyola Marymount University in Los Angeles, Dr. Clark then went on to earn his optometry degree at the Southern California College of Optometry in Fullerton, California. He has a decade of experience in eye care, and truly enjoys helping his patients with all of their eye care needs. When not working with patients, Dr. Clark enjoys spending time with his wife and daughter. He enjoys music and is a self-professed car enthusiast.